¶ 3 Leave a comment on paragraph 3 0 John Hinchey calls this song the “troubled twin” of One of Us Must Know. He also notes the thematic similarity to She’s Your Lover Now, the outtake from the Blonde on Blonde sessions that appears on The Bootleg Series Volumes 1-3. ¶ 4 Leave a comment on paragraph 4 1 Temporary Like Achilles is one of the weaker songs on Blonde on Blonde. The main problem is that the lyrics have a distinct thrown together feeling. “But is your heart made out of stone, or is it lime/Or is it just solid rock?” … “I watch upon your scorpion/Who crawls across your circus floor”… “Like a poor fool in his prime/Yes, I know you can hear me walk”… Not Dylan at his best. ¶ 5 Leave a comment on paragraph 5 0 The last verse introduces the character, Achilles, the new lover of the woman in question. It’s interesting to consider why Dylan named the character Achilles, the hero warrior of the Trojan Wars in Greek mythology. 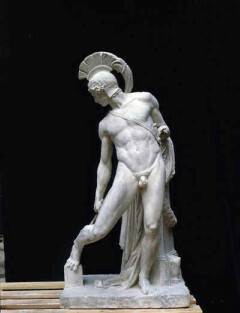 In at least one myth, Achilles is killed after being hit in the heel by an arrow (thus the term “Achilles’ heel”). In the song Achilles is the new “guard” of the ex-lover. I guess it makes some sense that a Greek warrior would make a good guard. Why is Achilles “temporary”? Is the narrator telling us that he was just a temporary plaything of his ex-lover, that the new lover Achilles will only be temporary as well? It’s a mystery I suppose. ¶ 6 Leave a comment on paragraph 6 0 Temporary Like Achilles has never been played live. Yes, I’ve been here before. I’m looking at your second door. Yes, I guess I’ll be here for a while. I’m helpless, like a rich man’s child. Honey, but you’re so hard. And he’s hungry, like a man in drag.